Is the Press Too Big to Fail? From climate change to financial meltdown, the worst of our journalism is becoming the norm. In the previous century, there was a brief Golden Age of American journalism, though what glittered like gold leaf sometimes turned out to be tinsel. Then came regression to the mean. Since 2000, we have seen the titans of the news presuming that Bush was the victor over Gore, hustling us into war with Iraq, obscuring climate change, and turning blind eyes to derivatives, mortgage-based securities, collateralized debt obligations, and the other flimsy creations with which a vast, showy, ramshackle international financial house of cards was built. When you think about the crisis of journalism, including the loss of advertising and the shriveled newsrooms — there were fewer newsroom employees in 2010 than in 1978, when records were first kept — also think of anesthetized watchdogs snoring on Wall Street while the Arctic ice cap melts. Deserting readers mean broken business models. Per household circulation of daily American newspapers has been declining steadily for 60 years, since long before the Internet arrived. It’s gone from 1.24 papers per household in 1950 to 0.37 per household in 2010. To get the sports scores, your horoscope, or the crossword puzzle, the casual reader no longer needs even to glance at a whole paper, and so is less likely to brush up against actual — even superficial — news. Never mind that the small-r republican model on which the United States was founded presupposed that some critical mass of citizens would spend a critical mass of their time figuring out what’s what and forming judgments accordingly. Don’t be fooled, though, by any inflated talk about the early days of American journalism. In the beginning, there was no Golden Age. To be sure, a remark Thomas Jefferson made in 1787 is often quoted admiringly (especially in newspapers): "If it were left to decide whether we should have a government without newspapers or newspapers without a government, I should not hesitate for a moment to prefer the latter." Of course, press watchdogs also licked the hands of the perpetrators when Washington overthrew democratic governments in Iran in 1953, Guatemala in 1954, and when it helped out in Chile in 1973. As for Vietnam, it wasn’t as simple a tale of journalistic triumph as we now imagine. For years, in manifold ways, reporters deferred to official positions on the war’s “progress,” so much so that today their reports read like sheaves of Pentagon press releases. Typically, all but one source quoted in New York Times coverage of the 1964 Tonkin Gulf incidents, which precipitated a major U.S. escalation of the war, were White House, Pentagon, and State Department officials (and they were lying). In the war’s early years, at least one network, NBC, even asked the Pentagon to institute censorship. Nonetheless, the sense that the war was an unjustifiable grind grew, especially after the Vietnamese launched the Tet Offensive of January-February 1968, startling the U.S. military, Washington officials, and journalists alike. When, in 1969, Seymour Hersh reported for the tiny Dispatch News Service that a unit from the Americal Division had slaughtered hundreds of Vietnamese civilians in a village named My Lai, his story went mainstream. On February 24, 2002, as the scandal of the derivative-soaked Enron Corporation unfolded, the New York Times’s Daniel Altman did distinguish himself with a page-one business section report headlined “Contracts So Complex They Imperil The System.” He wrote: “The veil of complexity, whose weave is tightening as sophisticated derivatives evolve and proliferate, poses subtle risks to the financial system — risks that are impossible to quantify, sometimes even to identify.” He stood almost alone in those years in such coverage. Most financial journalists preferred then to cite the grand Yoda of American quotables, Federal Reserve Chairman Alan Greenspan. And he was just the first and foremost among a range of giddy authorities on whom those reporters repeatedly relied for reassurance that derivatives were the great stabilizers of the economy. In a syndicated column on Christmas Eve, way-out-of-the-mainstream columnist Molly Ivins was not so poker-faced. She called the new law “a little horror.” And in that she stood alone. That was it outside of financial journals like theAmerican Banker and HedgeWorld Daily News, which, of course, were thrilled by the act. That magic word “modernization” in its title evidently froze the collective journalistic brain. Or in those years consider how the New York Times covered the exotic derivatives called “collateralized debt obligations,” among the principal cards of which the era's entire international financial house was built. These tricky arcana, marketed as little miracles of risk management, multiplied from an estimated $20 billion in 2004 to more than $180 billion by 2007. The Times’s Floyd Norris drily mentioned them in a 2001 front-page business section article about American Express headlined “They Sold the Derivative, but They Didn't Understand It.” He quoted the CEO of Wells Fargo Bank this way: "There are all kinds of transactions going on out there where one party doesn't understand it." From then on, no substantial Timesfront-page business section article so much as mentioned collateralized debt obligations for almost four years. In 2009, in an enlightening article in the Columbia Journalism Review, Dean Starkman, a former staff writer at the Wall Street Journal, looked at the nine most influential business press outlets from January 1, 2000, through June 30, 2007 — that is, for the entire period of the housing bubble. A total of 730 articles contained what Starkman judged to be significant warnings that the bubble could burst. That’s 730 out of more than one million articles these journals published. When it came to our financial titans, in all those years the press rarely felt the need for a dissenting voice. Now, on the great subject of our moment, the press repeatedly clutches for the rituals of detachment. Two British scholarsstudying climate coverage surveyed 636 articles from four top United States newspapers between 1988 and 2002 and found that most of them gave as much attention to the tiny group of climate-change doubters as to the consensus of scientists. And if the press has, until very recently, largely failed us on the subject, the TV news is a disgrace. Despite the record temperatures of 2012, the intensifying storms, droughts, wildfires and other wild weather events, the disappearingArctic ice cap, and the greatest meltdown of the Greenland ice shield in recorded history, their news divisions went dumb and mute. The Sunday talk shows, which supposedly offer long chews and not just sound bites — those high-minded talking-head episodes that set a lot of the agenda in Washington and for the attuned public — were otherwise occupied. The mounting financial troubles of journalism only tighten the muzzle on a somnolent watchdog. It’s unlikely that serious business coverage will be beefed up by media companies counting their pennies on their way down the slippery circulation slope. Why invest in scrutiny of government regulators when the cost is lower for celebrity-spotting and the circulation benefits so much greater? Meanwhile, the nation’s best daily environmental coverage takes a big hit. 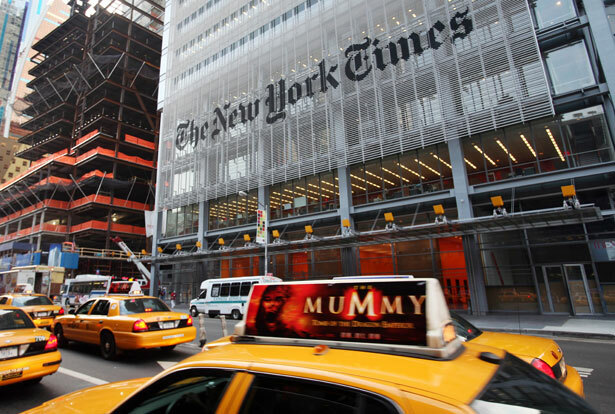 In January, the New York Times's management decided to close down its environmental desk, scratching two environmental editor positions and reassigning five reporters. How could such a move not discourage young journalists from aiming to make careers on the environmental beat? The rolling default in climate-change coverage cries out for the most serious professional self-scrutiny. Will it do for journalists and editors to remain thoroughly tangled up in their own remarkably unquestioned assumptions about what constitutes news? It’s long past time to reconsider some journalistic conventions: that to be newsworthy, events must be singular and dramatic(melting glaciers are held to be boring), must feature newsworthy figures (Al Gore is old news), and must be treated with balance (as in: some say the earth is spherical, others say it’s flat). Todd GitlinTodd Gitlin, a professor of journalism and sociology, is chair of the PhD program in communications at Columbia. His new book, Occupy Nation: The Roots, the Spirit, and the Promise of Occupy Wall Street, is forthcoming in April from HarperCollins.